"My housemates and I were all watching the lightning and I thought, 'This will make a great Snapchat'. The next thing I know there's fire raining down from the sky." On Saturday, several parts in South West England witnessed violent storms. Plymouth student Alex Sawyer thought the wild weather would make for a good Snapchat video. The clip turned out to be more than just good. Alex and his friends were outside filming the storm when lightning struck just metres from them. He described his close call as "fire raining down from the sky". "My housemates and I were all watching the lightning and I thought, 'This will make a great Snapchat'. The next thing I know there's fire raining down from the sky. Torrential rain. We were right in the middle of it," Alex told Plymouth Herald. Alex and his pals escaped without any injuries. The lightning bolt hit a nearby building. Firefighters were called in after damage was reported to many properties in the area. 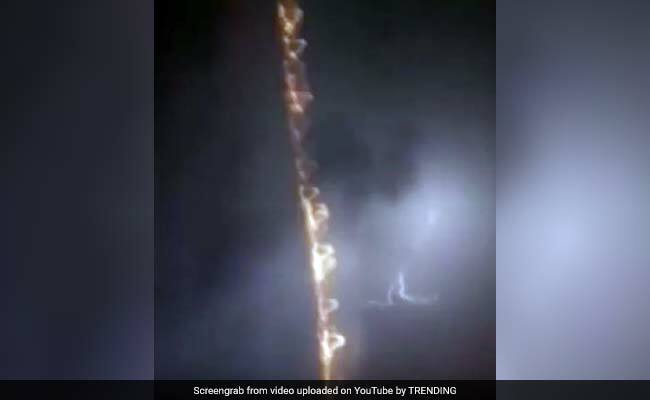 Locals posted several videos on social media as thunderstorms battered several parts of South West England. The Met Office has predicted more torrential rain and icy hail ahead.